Hortus Camdenensis | Potentilla missourica Schrad. Fully hardy, upright perennial with pinnate leaves consisting of 5-19 leaflets and abundant yellow flowers in terminal panicles in summer. [RHSD, Hortus]. 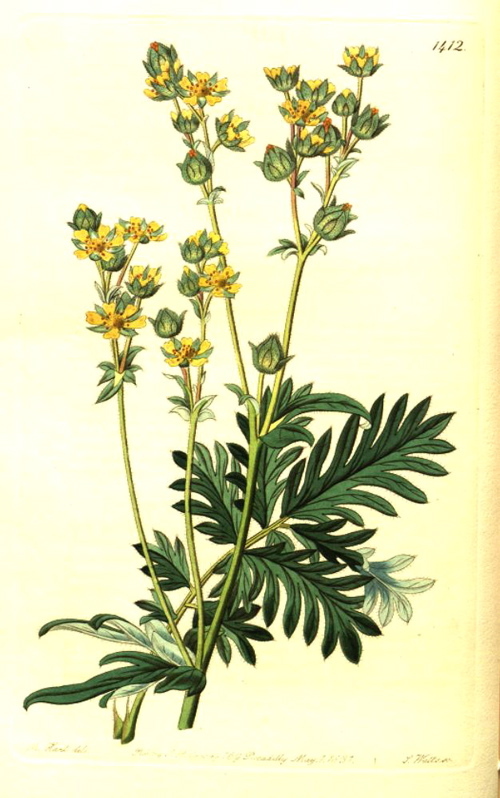 ‘From [Potentilla pennsylvanica] it is known not only by its hoariness, but also by the nakedness of its inflorescence, its minute petals, and its more deeply pinnatifid leaflets. A hardy perennial, native of North America. The plant from which our drawing was taken grew in the Garden of the Horticultural Society, where it had been raised from seeds collected in arctic America by Dr. Richardson.’ [BR f.1412/1831]. 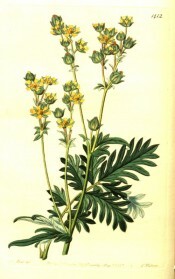 Potentilla missourica was introduced to Britain in 1827 and P. pennsylvanica in 1725. [JD]. Listed in the 1845, 1850 and 1857 catalogues [H.191/1845]. Macarthur ordered seed of Potentilla missourensis from Warner & Warner, Seedsmen and Florists, Cornhill, on 12th April 1846 [MP A2933-1, p.131], although this plant is not listed in The Gardener's Chronicle advertisement of 12th April, 1845, referred to by Macarthur. More details about Potentilla missourica Schrad.